Mmmmm, quinoa tabouli. This is probably my favorite salad ever. It’s easy to make, super nutritious, and SO TASTY. I love substituting quinoa for starchier foods like cous cous or rice. It’s high in fiber and protein, and I just can’t get enough of the nutty, crunchy flavor! I like to use ripe little cherry tomatoes in my quinoa tabouli. I think they are more flavorful, but larger tomatoes work just fine. If you don’t have red onion, green onions can be a good substitute as well. 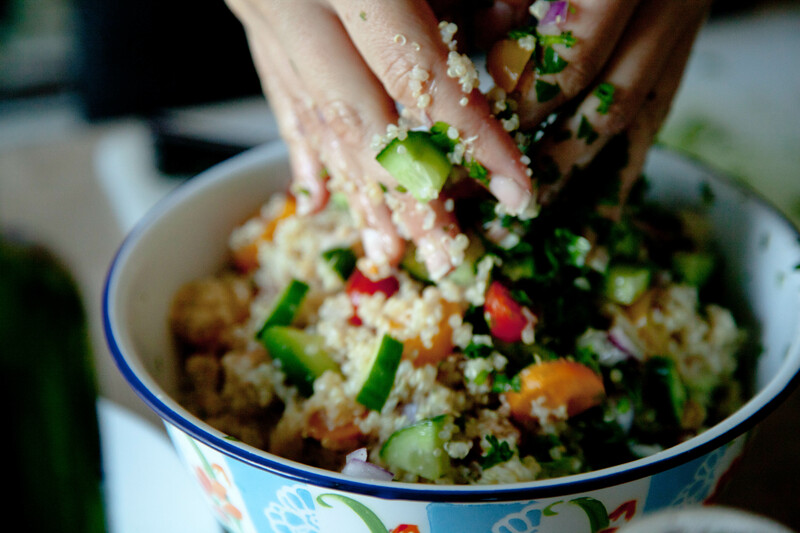 In a large bowl, combine the quinoa with the tomatoes, parsley, onion, and cucumber. So there you have it, quinoa tabouli. Try it on top of a mixed green salad with a bit of balsamic drizzle. It also pairs well with our Superfood Parsley Hummus in an easy, delicious wrap. I like to make a big batch at the beginning of the week for healthy, no-fess lunches all week long. It’s sooooo good!